e-mail. They instantly agreed! And we are happy to present this article to you today. It will give you a lot of insights in the activities of the Ghostbusters Dutch Division. We love it! The group originally started almost six years ago as an internet group. During the first two years, their activities mainly were on the internet, where they discussed the movies, the props etc. But none of them actively geared up and went out as Ghostbusters. After a while, Andre joined the group and he thought it would be great to share the passion. To actually go out, be Ghostbusters and spread the love of all things related to Ghostbusters. Last year the original group ceased to exist, but Andre took the name with him (since he had registered it at Sony). He started a new group, with some of the old members and they revamped and re-imagined the group. GhostCorps: Ghostbusters Dutch Division was born. They are an active group with 14 members and they spend every free moment visiting conventions, but also doing charity work. Their goal is to keep the love for both the old movies alive, as well as the new one. "There are several chapters all over the world. In America, for instance, every state has its own chapter, and in Europe, we see several groups as well, mostly one per country, but there are places where there are several groups per country. We don't actively work with any other groups, mostly because of distance. But we have an active working Alliance with the Ghostbusters German Division. They inform us about and invite us to conventions in their country. And of course, we do the same. There is a lot of internet contact between all the chapters in the world, mostly through a large amount of Facebook groups." It sounds like they are accomplishing their goal very well! At least from our point of view. We always enjoy seeing the Ghostbusters Dutch Division at conventions. It keeps the spirit alive and it keeps on reminding us of the awesomeness of Ghostbusters. So.. let's talk about conventions! 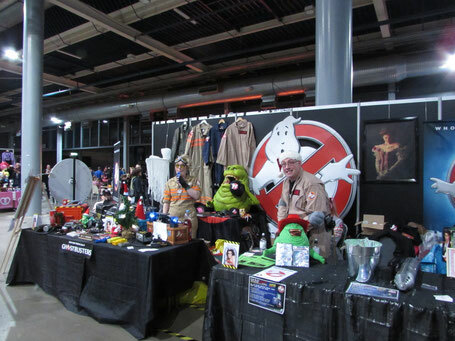 Ghostbusters Dutch Division attends all of the major conventions in the Netherlands. With the rise of several new ones, they are working to get an agreement with the new ones. They also attend conventions abroad, but only the ones within driving distance like Frankfurt and Germany. And of course, we asked what the best thing is about being at a con with the Ghostbusters Dutch Division. "The intense amount of fun we have together, which reflects on the people attending the con. They join in for a sing-a-long, ask for pictures and ask away about all the props that we are bringing. And always they are greeted with a smile. We love what we do, and we do what we love. And I am sure, from all the positive comments that we have gotten, that it shows." 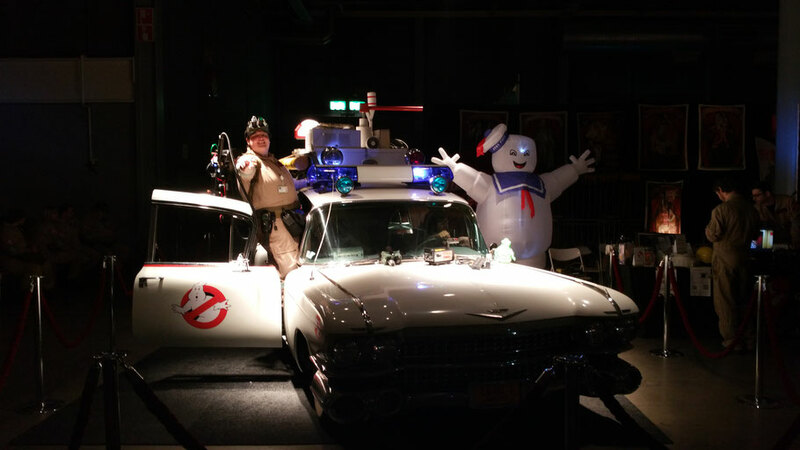 " That has to be the recent Dutch Xmas Con, mainly because we saw the Ecto 1 from the new movie there for the first time. But it's really hard to pick out one that stands out. As said we do what we love and we love what we do. And all the cons we attend we are greeted by people who follow us on Facebook, and together with them we turn every con into something special." And we also want to know.. How much work is it to prepare for a convention? "It depends on the con. Most cons are easy but a convention like DCC of DXC takes a lot of planning. We have a lot of space to fill and there will be visitors from all walks of life. We want to ensure that there's something for everyone. Be it actively participating in something at our booth or just enjoying all the wonderful things on display. And of course, there's music. What would Ghostbusters be without the theme song?" Since we always love meeting actors at conventions, we were curious about meeting Ghostbusters actors. 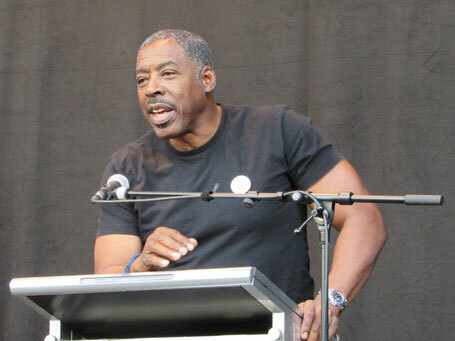 We already met Ernie Hudson 2 years ago which was great! So we asked Andre: When there are guests from Ghostbusters will you go and talk to them/ take pictures or go for an autograph? "Oh, of course, we event travel for it. If a guest were to be attending in Germany or Belgium, no doubt we would go there. Some of us even had their proton packs signed by actors." That is so cool! Which actors/ actresses from the movies have you already met? "We had the pleasure of meeting Dan Aykroyd in Cologne two years ago, which was really the highlight of my Ghostbusters fandom and we met Ernie Hudson in Ghent a year ago. Both were amazing to talk to and really took their time with the fans. Apart from those two, we haven't had the pleasure of meeting any Ghostbusters actors in person. But we do have two actors in our friends list on Facebook. And they are both awesome and really love it when fans contact them." And who would you still love to meet? "Well apart from Bill Murray of course, who is number one on the list but also nearly impossible to meet, there would be Kate McKinnon and Kristen Wiig from the new movies. And from the classics, I would love to meet Robin Shelby, William Atherton, and Annie Potts." "Well, we get asked more and more, from large conventions to small gatherings and all sorts of events in between. It's the result of what I described above. Wherever we are, we meet people with a smile and take our time to answer questions, or just talk. This results in us being asked more and more. To be honest our 2017 roster is so full we aren't sure we can attend them all." "We actively support Stichting Opkikker, a foundation who supports children with long-lasting illnesses as well as their families. Their goal is to take their mind off their troubles for a day. And we help out whenever we can. The "Fantasydag" is a day where they travel through all sorts of wonderful worlds and engage in special activities there. One of the stops is Ghostbusters, where they get to clear out ghosts from our firehouse and help out creating slime in our lab. Also in the past, we collected money for KIKA, an organization devoted to kids with cancer. We raised money for them at our first event. We hope to be able to pick it up again this year." We'd like to thank the Ghostbusters Dutch Division for answering all of our questions (we had so many questions haha). We think you're doing great work. And we hope that all of you enjoyed reading this and have a better insight now in what kind group this is and what they do. It's a lot of work to maintain a group and attend all the events. And we're just lucky we can enjoy it at conventions! Ghost Busters was truly iconic when I was younger! Just hearing their intro music... everyone knows the lines! My boyfriend is also a fan. It's great to see some of your childhood favorites come back to life. From a cartoon to the real thing. What a great piece of wonderful information. My older brother and i grew up with the Ghostbusters. Nice work! I only be gratefull and happy that a group of such wonderfull people like this, exists! Ghost Buster completes my childhood years, and their theme songs keeps running on my head back then. It was so fun, both the movie and the cartoon versions. Interviewing the icons is a huge achievement and congrats for that. It's good to learn about their charities and good work they have been doing apart from making people laugh! Ghost buster convention?? Wow! That sounds like an a super fun event for every ghost buster fan. There's nothing that brings out the inner child and makes it happy than actually getting to meet the star cast of the movie! Wow, their work is awesome! You know that they really love what they're doing. I like that they don't just promote and attend conventions but also do charity work. Kudos! This must have been one hell of a FUN experience considering you love GhostBusters so much. I definitely do have a better insight about GhostBusters Dutch Division now that I've read your article. Thanks for sharing this wonderful experience. Ghostbusters is a true classic! I don't know of anyone who hasn't heard of that line: "Who ya gonna call?!" You always meet the most interesting people! You sure have plenty of cool stories to tell! It must be such a memorable experience not only to see the people who personify the cartoon characters but to get to interview them too! I grew up watching Ghostbusters. We lived at my aunt's place then and my cousin was a huge fan of Ghostbusters. It is indeed delightful to know that the members of the group are all accommodating and amiable and even granted your request for an interview. Great read, by the way. How great that you wrote about Ghostbusters! It was my favorite movie when I was younger, still remember their theme song! I am so glad they run the Ghostbusters groups all over the world! 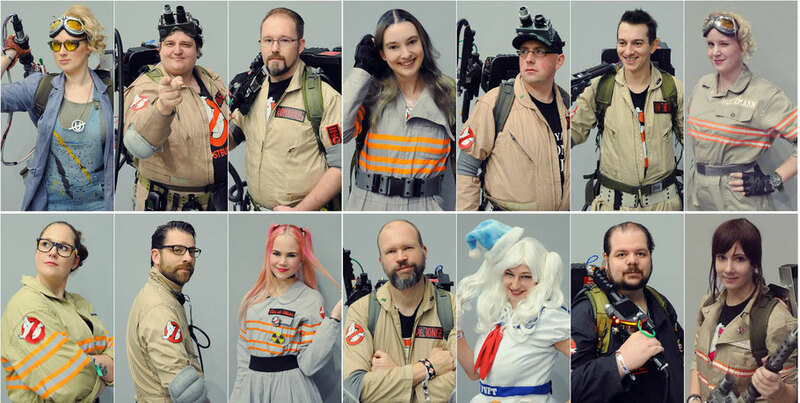 It was interesting to know about your experience at Ghostbusters Dutch Division convention and many thanks to these wonderful people for the interview! Enjoy reading your post! One of the best movies of my childhood! I still remember the first time I saw the original! It blew my mind off! I am envy of you of meeting the actors! Have to say I still have not see the new one! Giorgos, I have seen it last week. We will have a review about it soon, so keep checking the website! The name Ghostbusters is a curious name. Initially, I thought this group is about ridding places of ghosts but I was mistaken.But, anyways, the activities of the Ghostbusters Dutch Division are noble. I wish them good luck. Ghost Buster completes my childhood and I enjoyed their movie so much! It was my favorite movie when I was younger! You always meet the most interesting people!